A discussion paper, titled Rights & Responsibilities 2014, was released on 29 August 2014. The paper set out the context of the consultation, including a brief overview of and questions about the rights to freedom of expression, religion, association, and property rights. The discussion paper is available on the Commission’s Rights & Responsibilities 2014 webpage and hard copies of the paper were distributed at meetings. An online survey was available for completion between 1 September and 14 November 2014. Written submissions were invited and accepted from 1 September to 19 December 2014. The online surveys were anonymous. The Commissioner received 68 written submissions and 991 survey forms. Submissions provided to the consultation are listed at Appendix A. The surveys and submissions were reviewed and analysed in relation to rights to freedom of expression, religion, association, and property rights. A broad scope of additional issues and themes raised in submissions were also considered and, where consistent themes were articulated, these issues are included in this report. Research was undertaken from primary and secondary sources about human rights issues in each state and territory to inform decision-making about the places and organisations to visit. The Human Rights Commissioner held 13 public events in Adelaide, Alice Springs, Darwin, Canberra, Perth, Cairns, Charters Towers, Brisbane, Sydney, Singleton, Hobart, Melbourne and Lorne. Public events were extensively advertised through the Commission’s email subscription list, social media, Commission media releases and e-alerts, newspaper articles and opinion pieces, and radio interviews with the Human Rights Commissioner. The Human Rights Commissioner also held more than 60 meetings with individuals and organisations to inform the consultation. 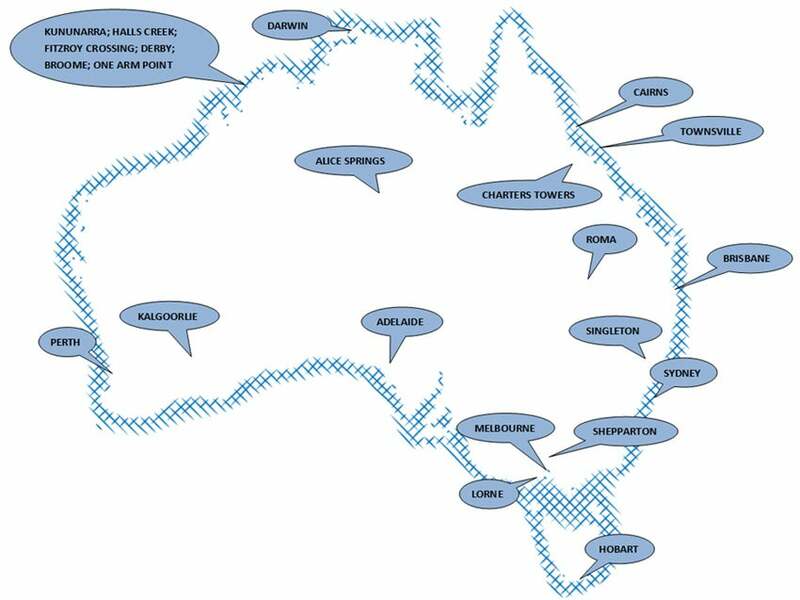 These meetings were held in Kununurra, Halls Creek, Fitzroy Crossing, Derby, Broome, One Arm Point, Kalgoorlie, Perth, Adelaide, Alice Springs, Darwin, Canberra, Cairns, Townsville, Charters Towers, Brisbane, Roma, Sydney, Singleton, Hobart, Melbourne, Lorne and Shepparton. Altogether, the Human Rights Commissioner consulted with over 1 100 people at public events and meetings as part of Rights & Responsibilities 2014. A map highlighting the places visited is shown below. The names of individuals and organisations who met with the Human Rights Commissioner are set out in chronological order at Appendix B. On 7 August 2014, the Human Rights Commissioner convened Free Speech 2014, a symposium to highlight the fundamental role of free speech in Australia’s liberal democracy. Matters relating to the right to freedom of expression in Australia, such as political donations, copyright legislation, whistleblower protection and defamation laws were discussed at the symposium. These discussions also informed the Rights & Responsibilities 2014 consultation. The survey contained both closed and open questions on the rights to freedom of opinion, expression, religion and association, and property rights. Information to identify people who completed the online survey was collected only to ensure data validity and reliability. Sources include Commonwealth, state/territory government documents; research undertaken by civil society, the non-government sector and business organisations; and media sources.